It's hard to argue at this point that Apple didn't rush out iOS 7 in order to hit the Worldwide Developer Conference deadline. The software itself is pretty buggy, the design seems unfinished in many placed, and the biggest clue of all: there was no iOS 7 beta for the iPad. Well, we're just getting the first leaked screenshots of iOS 7 on the iPad, and it looks just about how you'd expect. The screenshots come from ApfelPage.de and show various parts of the OS like the settings, search, Safari, contacts, etc on the iPad. As you would expect, the UI looks a lot like what we've already seen on the iPhone, although some features (like the Control Center) look much better on the iPad, while others (search) don't look like they've been optimized properly for the larger screen size. One odd thing is that as you can see on the Control Center, there is an iPad optimized flashlight toggle, but none of the current iPads have a rear flash. In general, we don't want to read too much into such early software, but this could point to the addition of a rear flash either on the next-gen iPad or iPad mini. Thanks to Spiderman4 for pointing that out! 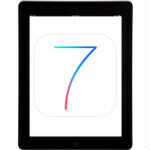 The official iOS 7 beta for iPad is expected to be released in the next few weeks. What side are u on anyway Wendy? He is on trolling side. She knows how to act maturely..
Oh lord. Will you make up your mind. Last month you couldn't stand apple/iOS, now you love it again. You love iAttention. She/he/it blasts us for being iOS users, now look. At least we're not flip flippers. I prefer your previous avatar. next news is " samsung is making 15 inch galaxy s5" wow mouth watering na...? Thanks, I updated the article to mention that! What's with the opening sentences of the article? Do you not know how a BETA works? They didn't rush anything out, they got it out now so developers can beta test and update their apps before the final update is pushed it. Of course there's bugs, it's a BETA! I agree with a Michael. Based on past Apple scenarios, even final products may be rushed, for example like it was with Apple Maps. Apple introduced Apple Maps as final product, but in reality Apple Maps was not finished and almost unusable. You mean like the current desktop iteration of Google Maps? As for iOS 7 Beta 1, it was rushed, and there are still more features coming to iOS 7. Development was stopped for WWDC to get a stable beta. can u tell one more thing except maps..? The calendar icon on the iPad sure looks messy as hell with the dots all over the place. Im starting to get the feeling that Apple is changing things up just for the sake of it! Maybe they hired some kids, gave them too much control and now the Apple office is up side down? they should make a movie out of this chaos. Where the hell is the dislike button.....??? Not gonna use it on the ipad but i m missing it veeery much....!!! The dislike button was for trolls only. If you don't like something, you can say so with words. But it's much easier to just hit the dislike button. And somebody might have already said the thing I would like to say. Like/dislike system is very good to see peoples opinions. I think that the like button cannot exist without the dislike button, because now if a comment has for example 20 likes I might think that people like that thing but in reality there would be 50 dislikes for that comment. We have people in public looking like idiots using iPads as cameras, now as flashlights too? Great.